Platypus | That Belongs in a Museum! Hello. My name is Eric and I write a zine called “Junk Drawer,” and junk drawers are kind of like museums of little odds and ends, really, sometimes they’re things that are saved sometimes for a reason, and sometimes they don’t know why they really save things. And in thinking about what could go on in a museum, I looked through and the closest thing that I have was something I got a museum gift shop. 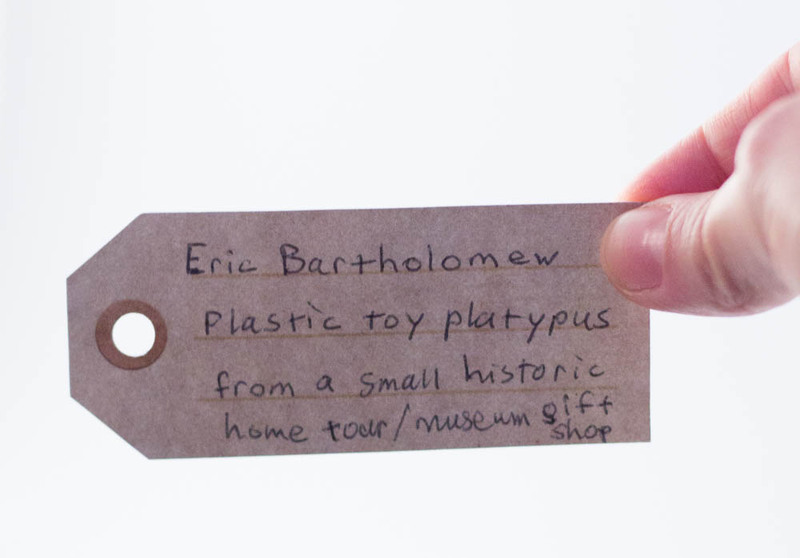 And I have a picture of it here; it’s a little plastic platypus. Museum gift shops often have a collection of little trinkets that relate to the museum. Sometimes they have those little odds and ends that don’t really seem to fit in. So for this one, I have to wonder why I would buy a little plastic platypus. I guess it was just so odd to see where it was being sold. It was in the gift shop at some little historic house out East which was giving tours. I don’t remember exactly which one this was, but the place had nothing whatsoever to do with water dwelling mammals. Evidently the historic house organization thought that guests might enjoy a souvenir platypus. I have seen gift shops like this offering trinkets completely irrelevant to the museum’s collection. The Supreme Court Historical Society has plenty of scales of justice cuff links and things you might expect from our nation’s highest court, they also have something called a “key keeper turtle.” Now, it looks like a turtle you can trust with your keys, but how it works is not even explained. You can see this turtle on their website in the miscellaneous section. I suppose items like these are really there to help fund the museum. With that in mind, I sometimes try to make a small purchase. I usually go for something useful that I would use anyway like a pen or a notebook. Anything else is bound to end up in the junk drawer. If only there was a Junk Drawer Museum. I would definitely visit there and buy something from the Junk Drawer Gift Shop.